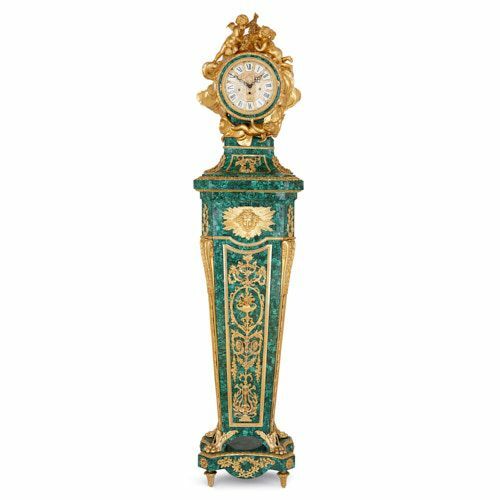 The bright green of the clock’s malachite gemstone veneer is wonderfully offset by the gold of the classically-inspired ormolu mounts and cherub sculptures. 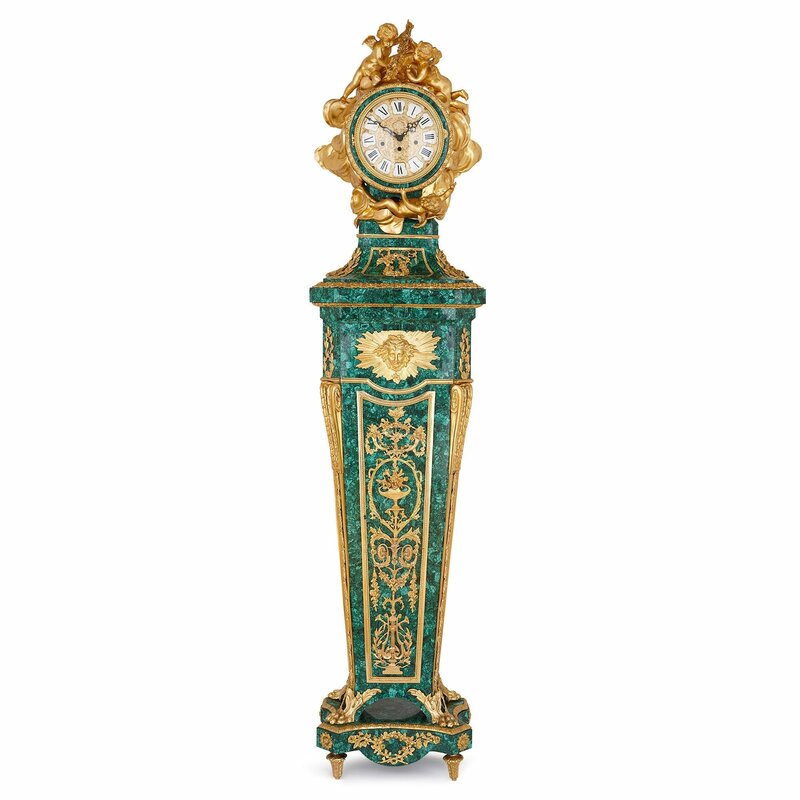 This large pedestal clock was created after a design by the famous Parisian ébéniste, Jean-Henri Riesener (1734-1806). It is crafted in the fashionable Louis XVI style, which was typical of Riesener's work. While the piece dates from the early 20th Century, the malachite veneer is a more recent addition. 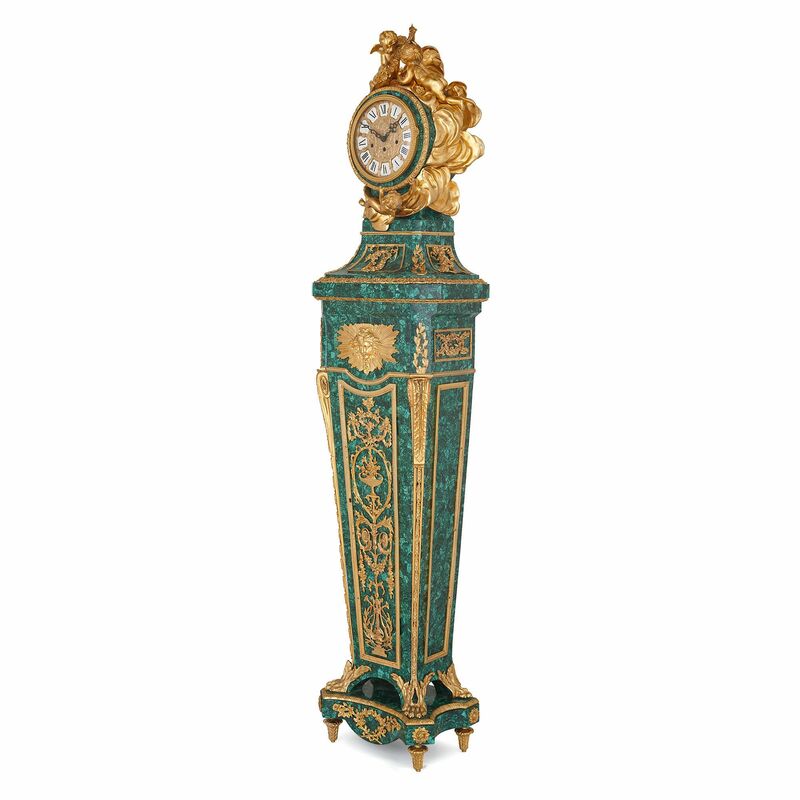 The clock stands on a shaped, cantered square malachite base, which is raised up on pointed ormolu feet. The base has been mounted, on its front, with a rose wreath, and with rosettes on its corners. 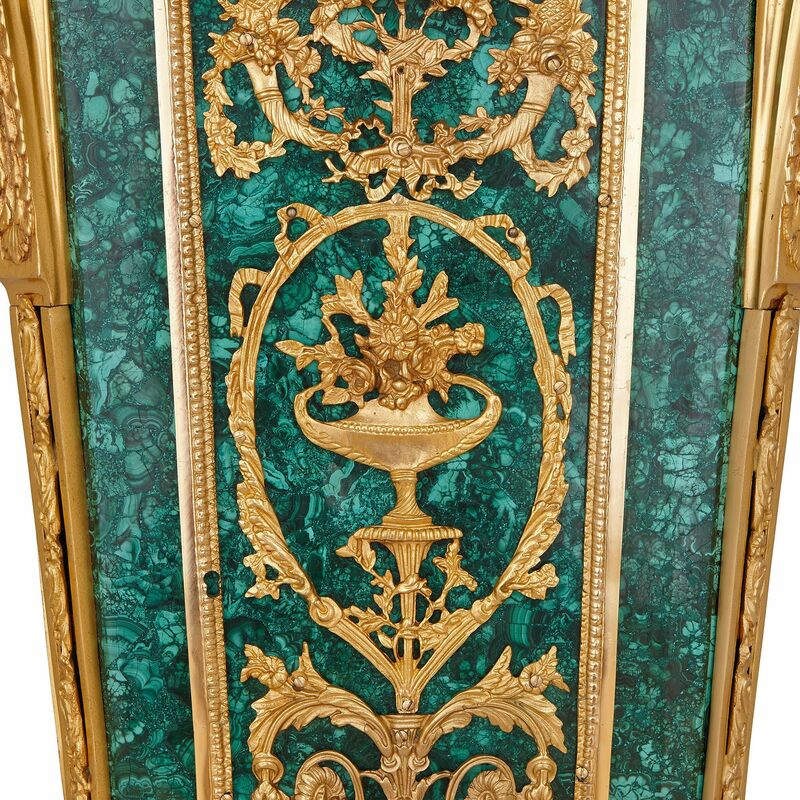 Above, the malachite pedestal case stands on four ormolu paw feet, which extend upwards, running as a line along the edge of the piece, before turning into scrolled brackets at the top. 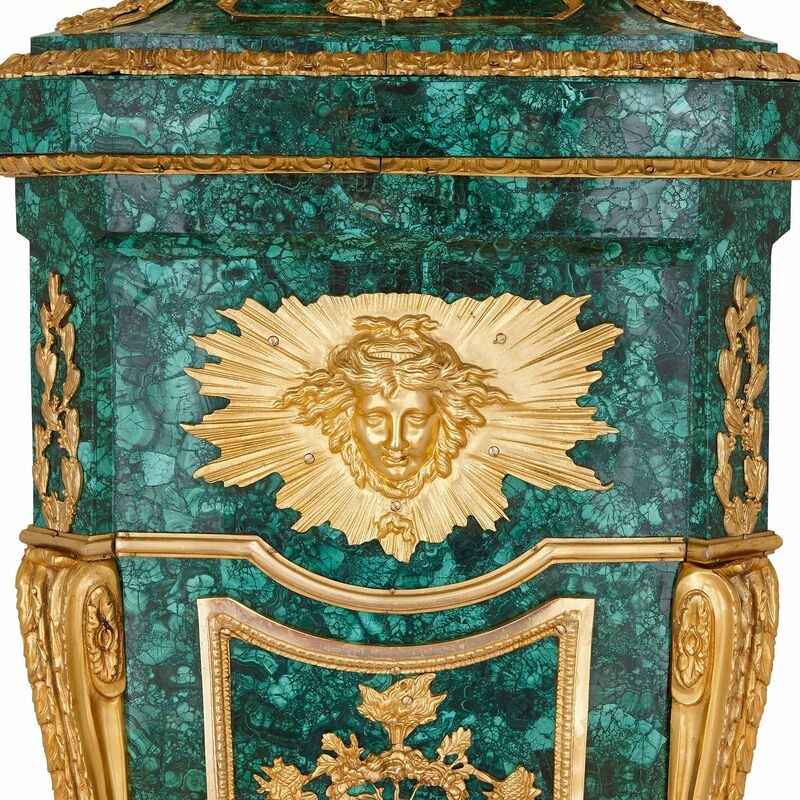 The pedestal's front and sides feature ormolu frames. Whilst the side frames are left empty, the front is decorated with ormolu classical and foliate motifs. This includes a lyre and pair of horns, a vase full of flowers, and cornucopias, all contained within floral swags and scrolling leaves. This front piece is surmounted by an ormolu sun-burst form, with a classical head — possibly the head of Apollo, the Greek god of the sun — at its centre. This is flanked on the corners and sides by foliate patterns. Two foliate cornice lines mark the transition from the body of the piece to the neck. 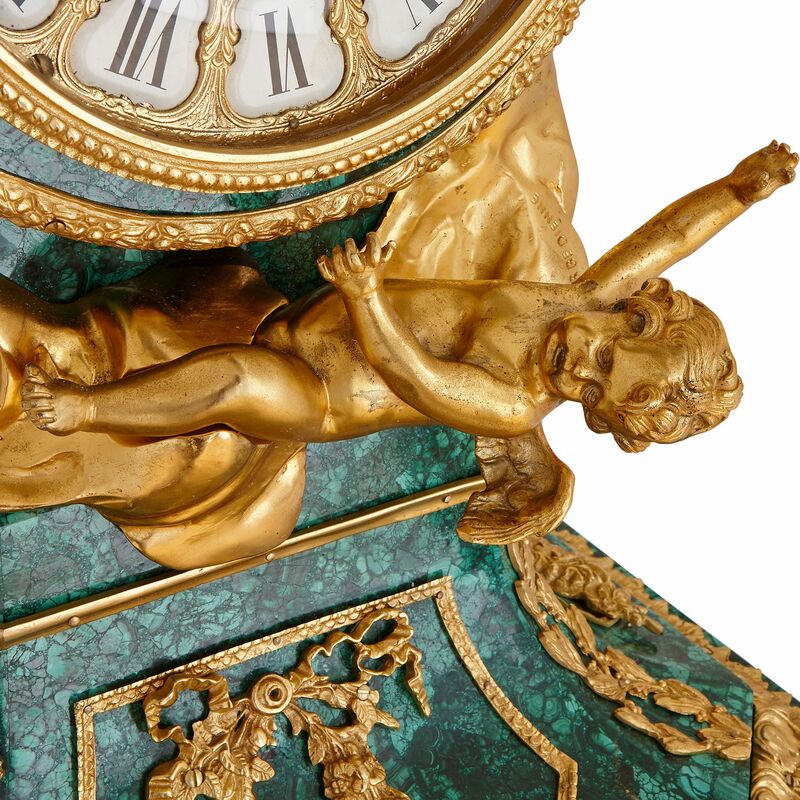 Above, the malachite neck is shaped, sloping in and then up to support the clock dial. This neck is mounted with tied, crinkled ribbons, which are set within ormolu frames, flanked by foliate patterns. The dial of the clock has been elaborately designed. 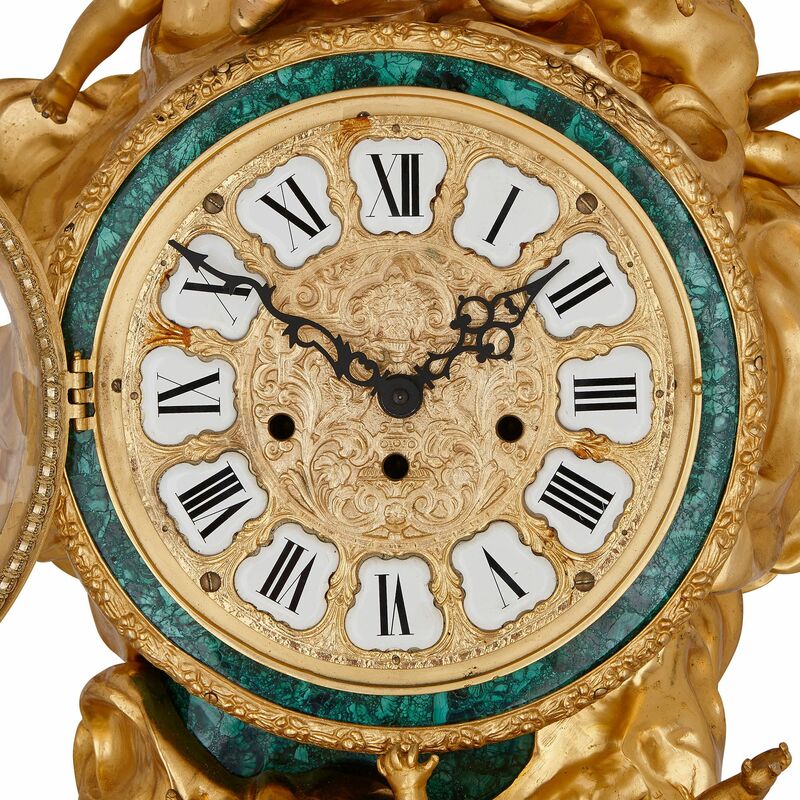 It has a decorative, ormolu face, with white enamel Roman Numerals, contained within an ormolu beaded bezel, set within a circular ormolu, floral frame. Three sculptural ormolu cherubs are positioned around the clock — one below, and two above — lying on a blanket of swirling clouds. 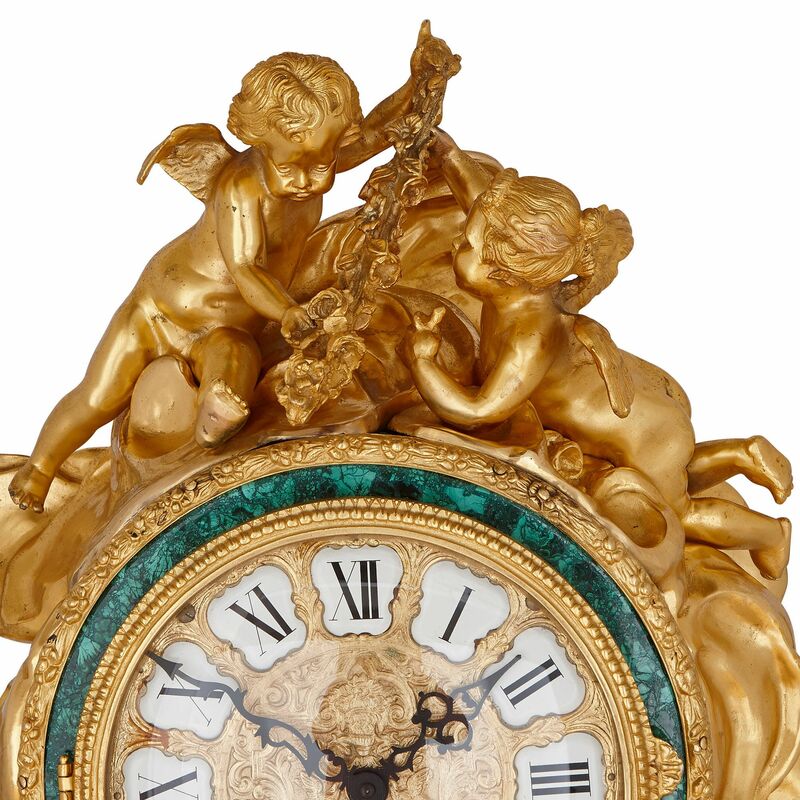 The two cherubs that top the clock face hold a garland of roses between them.